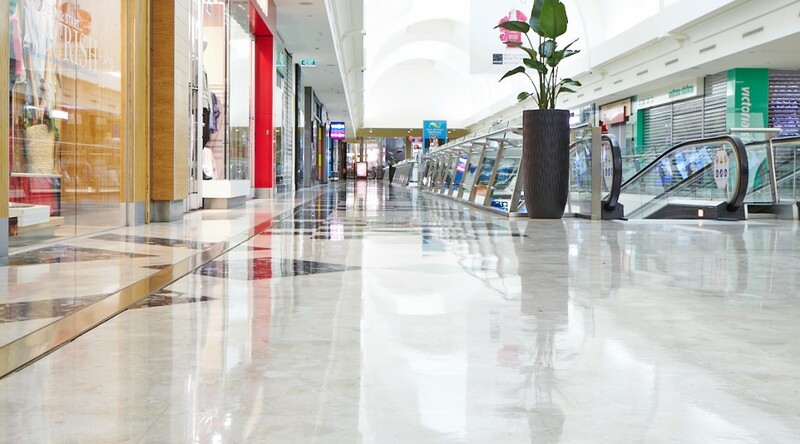 The benefits of applying a high quality floor sealer system to a floor are both the protection and the enhancement of what is a valuable asset. 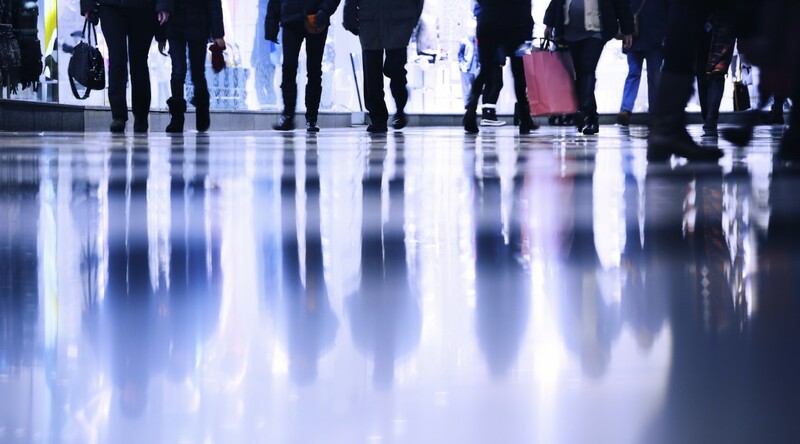 Floors are exposed to unrelenting abrasion from foot and trolley traffic, spillages and dirt which, without protection, can cause dulling of the floor surface and even wear it away. Once coated with a suitable sealer, the floor is protected from these threats. Furthermore, the surface becomes easy to clean with soil readily washed away, the colours of the floor are enhanced and the floor will have a higher and more even shine. By implementing a full protection system using complimentary sealers and maintenance products, this protection and enhancement will last indefinitely. The following is a guide for stripping and sealing floors to achieve the best result. If you are looking to cut back polish without performing a full strip, please refer to the previous guide: Seven tips for extending the life of your sealed floor. 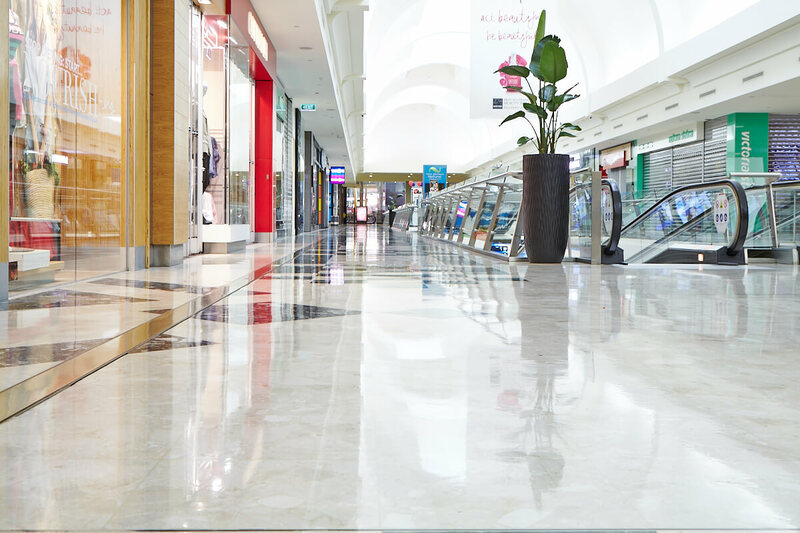 Floor Types: Terrazzo, marble, agglomerate marble, limestone and sadler tile. Always use a fresh mop for both stripping and sealing. First Base must be used so the film will bond to the floor and not flake off. Avoid sealing very cold floors (below 9˚C). If you must seal a cold floor, lay very thin coats at least one hour apart. Coverage: On average, one litre of sealer will cover 55 square metres of floor (one coat only). In practice, the first coat will require more sealer, and the last coats will require less. Porous floors will take more sealer. Sweep the floor to remove any rubbish. Scrape off any chewing gum and labels. Erect ‘wet floor’ signs and barricades to keep people off the floor. Place a large piece of cardboard on the floor next to the area being stripped. When you walk off the area with stripper on your shoes, step onto the cardboard to dry off your shoes. This will prevent ‘footprints’ appearing all over the floor. Using a wringer bucket with 12 litres of cold water in it, add 1¼ litres of Ultrastrip (5 cups). This is a 1:10 solution. If the floor has a thick coating, use double this amount (1:5 solution). Dip a stripper mop (old or used mops are OK) into the bucket of solution. Remove mop from bucket without wringing and let stripper pour all over floor. Repeat this process until the entire area is covered with a thick coating of stripper solution. If stripping a large area, divide floor into easy to manage sections and strip one section at a time. Leave the stripper on the floor for ten minutes, giving time to attack the sealer. Spread it with the mop if it dries or runs – always keep the floor evenly wet. During this time scrub the feet of shelves and fittings to remove old sealer and dirt. When time is up, scrub the floor with a scrubber (turn vacuum off) and black pads. Scrub the whole floor, starting at the point nearest to the power point if using an electric machine. Spend longer scrubbing the edges because the sealer will be thicker there. Test the floor by wiping the stripper aside and scraping with a coin to see if all old sealer film has been removed. If not, keep scrubbing. Wet vacuum all the stripper slurry up off the floor. Pour cleaner water all over the floor then vacuum this up to rinse the floor. Let the floor completely dry. DO NOT buff the floor. Put up barriers to keep people off the floor being polished. Mop on one coat of FIRST BASE. This can be done with a clean polish mop and wringer bucket (which is best) or a clean fringe mop and watering can. Spread the pour line as soon as possible after pouring. Lay the sealer up to the edges. Lay sealer as thinly as possible – never in pools as it will take a long time to cure. Do not walk on floor until it is dry. Let the first coat dry. It must not only be dry but also tack free, or not sticky, before laying the second coat. Test by placing your hand on the floor. Wait an extra 10 minutes after it is touch-dry before laying the next coat. On very porous floors, it is advisable to allow at least one hour for the first coat to dry properly. Mop on a second coat of First Base, but this time stay 30cm (12 inches) away from edges, along walls and furniture. The second coat, if being applied with the bucket and mop, should be laid at 90 degrees to the way the first coat was laid. Again, let the First Base dry until it is not sticky to touch, then give it 10 minutes more time. Mop on two coats of 3D-Gloss, allowing each coat to dry before laying the next. Keep 30cm from edges, except for the last coat which should go up to the edges. Give the floor six hours or more to cure, then buff the floor with Jaguar, Blue Ice or Champagne pads (on ultrahigh speed buffer) or red pads (on medium-speed buffer). Clean mops, pads and buckets with hot water and hang them up to dry. If fringes are to be used again soon, place them in a clean black garbage bag and seal the end so the fringe will stay wet until next time it is used. After 1-2 weeks, the floor can be buffed with Jackeroo Lite, Gorilla Lite or Combo Burnishing pads. After 1 week, scrub the floor with Florprep at 1 in 80 with red pads, rinse and let dry. Then apply 2 more coats of topcoat (3D-Gloss or 2020 Gloss). Next day, resume normal maintenance but use the softer Jaguar, Blue Ice or Champagne pads for buffing for 1 more week. that are old and shedding fibres as these will be visible in the film. plug or the finger of a rubber glove with a hole in it). work area. The pour-line should be about 80 – 100mm wide. floor is coated: avoid leaving any bare streaks. Move to the next 2m x 6m area and repeat the process until the whole floor has been coated. along the sides first to frame the wet area and then fill in.